OfficeMA Timesheet is a multi-user time tracking service ideal for business owners, managers, freelancers and consultants to keep track of time spent on tasks and projects. 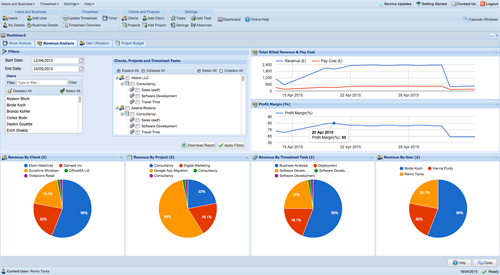 Using OfficeMA Timesheet you can visualise and produce powerful reports for revenue / hours analysis, user utilisation, project budget and expenditure. OfficeMA Timesheet is extremely easy to use, you can create an account in 2 easy steps. With a few clicks you can add clients, project, users and timesheet entries. With bulk import you can import hundreds of users, clients, projects and tasks in seconds. See how it works. OfficeMA Timesheet has many handy features. For example you can set the billing rates for tasks based on the task, the project or the individual users. For more details and to see what you can achieve take a tour of OfficeMA Timesheet's features. OfficeMA Timesheet is easy, fast, and secure cloud-based time tracking service. You can sign up in seconds with no upfront installation or complex setup. Your time is money, so OfficeMA Timesheet saves you time and money by enabling you to track the timesheets for yourself and your staff in a cost effective and time saving manner. You can create and manage accounts for your staff so that they can login from their Web browsers and fill their timesheets against the tasks you have assigned to them. Using OfficeMA Timesheet's powerful features you can import and manage hundreds of users, clients, projects and tasks in seconds. You can also restrict access to certain functions based on user role. Most importantly you can export all your OfficeMA Timesheet data into CSV or PDF. What's more, you can create a variety of reports such as revenue vs. cost analysis, user utilisation and project budget reports which you can easily use to monitor your business performance or to invoice clients. Create multiple user accounts for your employees with different access roles. Assign tasks to users to fill their timesheet. Add clients or customers then create projects and timesheet tasks for each client. For each client you can add projects. You can set hourly, daily or one off billing rates per project. Create tasks for each project and assign these tasks to users to book their time against. Enable your users to fill and update their timesheet. Administrators can generate reports from these entries. OfficeMA Timesheet features powerful reports such as hours and revenue analysis, user utilisation and project budget and expenditure. Export and download all your data as CVS or PDF files. Import your data, such as users, clients, projects, timesheet tasks and timesheet entries in seconds. Track time on your mobile by using the OfficeMA Timesheet Android or iOS App. Track time in Chrome or Firefox using the Timer extension. Set the billing rates for tasks based on common billing models. Control the tax rate and currency for billing. Set the billing currency and tax rates at the project level. Generate invoices in Word Document (DOCX) format from billable timesheet entries. Access OfficeMA Timesheet over a secure SSL connection. helpfully specially when bulk booking holidays"
"Thanks for the great service"
Copyright © 2015. All rights reserved. 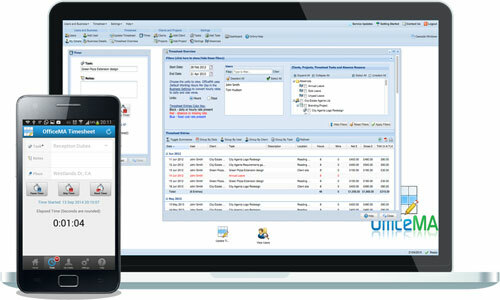 OfficeMA Timesheet is a service provided by iNetria Ltd.